Pahang is Malaysian's largest state dominated with ancient forest on the east coast of Malaysia. It promises exciting and fascinating richness to visitors of this tropical paradise. Kuantan, the capital of Pahang, has an air of unspoilt beauty providing travellers an unforgetable journey that spells adventure. Hyatt Regency Kuantan is located on Telok Chempedak beach, a short 16km or 30 minutes drive from Kuantan Airport and 10 minutes from town. Stretching along 800m of sandy beach, the hotel offers an unspoilt natural beach, recreational forest, exotic culture and tradition, plus first class amenities and facilities. Designed with rich, native wood beams, the spacious Malay style lobby provides a glimpse of the rustic charm of the Malaysian hospitality upon arrival. 336 rooms and suites provide sea or tropical garden views. Each room is tailored to luxury and comfort with a private balcony, bath and shower, piped-in-music, colour TV and in house movies, mini bar, tea and coffee making facilities, safe deposit box and international direct dial telephone system. For the discerning traveller, the Regency Club, a hotel within a hotel concept, provides the highest evening cocktails included. Room service is available 24 hours. Cocco Loco Bistro & Bar with an open-air lounge overlooks the South China Sea providing classic Italian dining. Live entertainment in the Bar offers an ideal place for pre and after dinner drinks. Kampong Restaurant, built on stilts with a typical Malay architecture design, serves western and Malaysian dishes for breakfast, lunch and dinner. Yue Yuen Chinese Restaurant serves delectable Cantonese and Szechuan cuisine. Delicious dim sum dishes are available for lunch. The Sampan Bar, a converted boat-bar, provides pre-dinner drinks with breathtaking views of the South China Sea. For workout diehards, there are 3 tennis courts and 2 squash courts. For watersports enthusiasts, the jet skis and outdoor swimming pools are ideal. 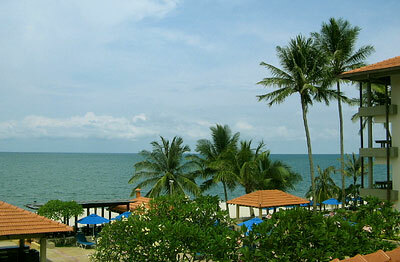 Alternatively, spend a relaxing afternoon lazing on the beach or beside one of the pools. The Meranti Ballroom is a multipurpose room with a capacity of 450 people for a sit-down dinner. Five smaller function rooms provide an ideai venue for smaller meeting groups. A Business Centre is available with secretarial services.